CathGrace celebrated her birthday yesterday with a present to her readers – a free pattern for her Sweet Sarah apron. It has a beautiful gathered bib with elastic across the top, and gathered skirt with two deep pockets. And today she’s back with a tutorial showing how to make a pretty gathered fabric flower to embellish it. Go to her birthday post to download the free Sweet Sarah apron pattern. Go to her fabric flower tutorial. 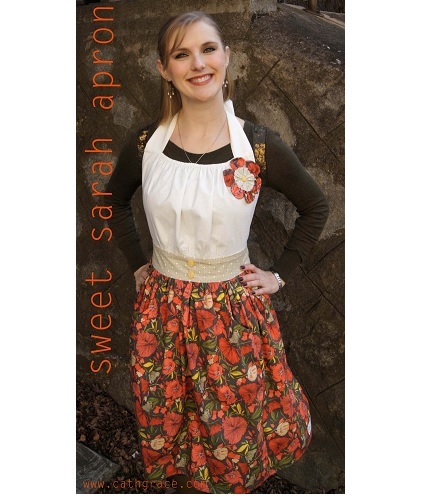 Thanks so much for featuring my Sweet Sarah Apron! I hope everyone enjoys making it!!!! I think the apron pattern is adorable!